Excuse the absence of a post on the Fourth of July and the promised post on ANGELICA SCHUYLER CHURCH. I want to bring to your attention an article in The New York Times titled “The Many Faces of a Wily Founder” by Jennifer Schuessler. 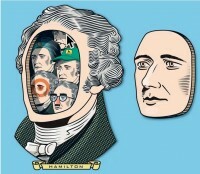 Of course, “the wily founder” is Hamilton. 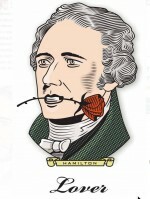 Illustrations by Peter and Maria Hoey accompany the piece, depicting Hamilton as Composter, Master, Love, Insulter, Prankster, Conniver, Student, Prognosticator, Victim, and Victor. Again interrupting the letters between SARAH LIVINGSTON JAY in Paris and MARY WHITE MORRIS in Philadelphia with news of an exhibition concerning fashion, which has been the subject of exchanges between the two women. Fashioning the Body: An Interesting History of the Silhouette is at the Bard Graduate Center Gallery 18 West 86th Street, New York, New York 10024; 212.501.3023. (See the review here.) The exhibit is less about actual clothing for men and women (and children!) than what lay underneath. Nine black velvet tailor’s dummies show changes that occurred in the female silhouette from 1700 to the present. Of course, my interest is in the 18th century silhouette and what men and women (the socially elite) wore under their garments to create the currently fashionable look. Men padded their torsos and enhanced their calves with lambs’ wool. Women encased themselves in whalebone stays, hoops, panniers, and stomachers. There is even an articulated pannier (large side hoops named for the wicker baskets on the sides of pack animals) with hinges that collapsed, allowing women to navigate narrow doorways. The conclusion one comes to is that women voluntarily submitted themselves to what amounted to torture to achieve the desired look of the time. Keep this in mind when admiring the gorgeous dresses of the period. The exhibit is on until July 26. ADVANCE NOTICE OF A READING to be given by the compilers/editors of In the Words of Women at the National Historic Park in Morristown, New Jersey, on August 16 at 1 pm. This site commemorates the encampment of George Washington and his troops during the winter of 1779-80, the coldest on record. Louise North, Landa Freeman, and I will give a PowerPoint presentation focusing on the lives of women during the Revolution and afterwards. Louise North will include material from her latest book The Travel Journals of Henrietta Marchant Liston, the wife of the British ambassador to the United States from 1796 to 1800. The talk will be followed by Q & A and the book by the trio will be available for sale and signing.